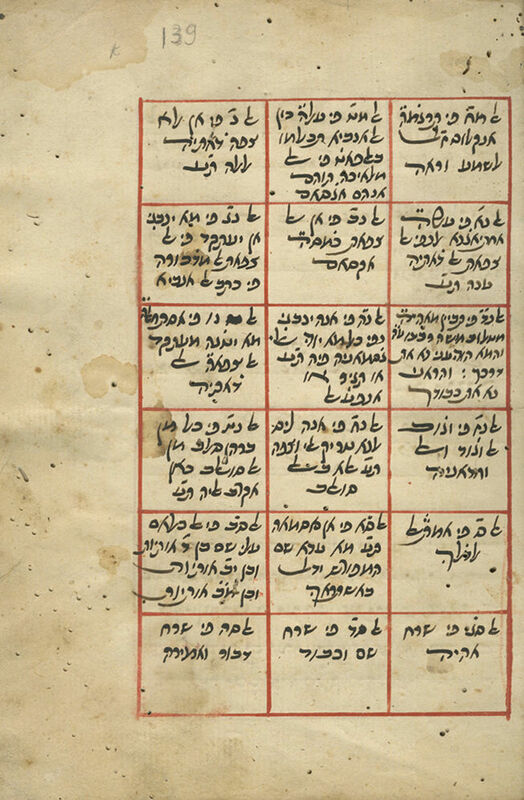 Manuscript, leaves from Part I of Moreh Nevuchim, by the Rambam, in the original language – Judeo-Arabic. [Egypt, second half of the 16th century]. This manuscript was presumably found amongst Cairo Geniza fragments. Neat scribal script, in red and black ink (titles, initial words, chapter numbers and ornaments in red ink). The watermark indicates that the paper was manufactured in Europe in the second half of the 16th century. The manuscript begins with tables listing the contents of the chapters (incomplete), the last square reads: "The chapter headings of Part I have ended". The tables are followed by short poems in praise of the work, two of them composed by the Rambam himself (printed in the Venice 1551 and Sabbioneta 1553 editions). The poems are preceded by a paragraph attesting that they (the two poems composed by the Rambam), were found in the original manuscript of the composition, handwritten by the Rambam himself: "In the manuscript which this copy was copied from it is written, that in the manuscript of the author R. Moshe son of Maimon, which he completed in Marcheshvan 1200, these poems were also found written there…" (translated from Arabic).Most of these poems are known from other sources, apart from the last poem, in Arabic (see translation in enclosed material), which is hitherto unpublished. This manuscript consists of 39 leaves, and contains: Table of contents at the beginning of the manuscript (lacking beginning; starts in middle of Part I, and lists chapters 48-74), poems in praise of the book, the preface, chapters 1-32 (complete), and part of chapter 33.
 leaves. 21.5 cm. Overall good condition. Stains. Minor worming to area of text, almost not affecting text. Extensive marginal worming. New binding.